InDesign is a piece of software that can be used for all manner of design and publishing. With the help of pre-made InDesign templates, you can take full advantage of this software to supercharge your workflow and complete projects in record time. Whether you’re working on a brochure design, flyer design, book, or magazine design, you can easily get a head start in your design process when using an InDesign template that’s already been designed and formatted by professionals. In this post, we’re featuring a hand-picked selection of various InDesign templates you can use with all kinds of projects. If you’re looking for inspiration, these designs will help you get a few new ideas as well. Working on a magazine design? Then these templates will come in handy. This bundle includes 3 different cover design styles with each template featuring 40 page layouts with multipurpose designs you can use to create any type of magazine. The template comes in A4 size and it can be easily customized with InDesign CS4 and higher. Company profile brochures take a major role is marketing and promoting a business. This modern brochure template is perfect for making a professional company profile for creative agencies and corporate businesses. It includes 20 unique page designs in both A4 and US Letter size. With this stylish brochure template, you’ll get to create business reports that’ll wow your audience. It features an elegant design that also allows you to properly structure the report content with paragraph styles, infographics, and more. The template includes 36 page designs. Every fashion store prints a fresh batch of flyers for each seasonal sale. This template is highly customizable and allows you to use it to create an attractive flyer to promote your seasonal sales and offers in style. The template is available in A4 size and can be customized with InDesign CS4 and higher. Corporate brochure templates usually look the same and boring. Using this creative tri-fold brochure template will help you stand out from that crowd. The template is easily customizable with InDesign CS4 and comes in US Letter size. Whether you’re promoting a fashion brand or making the product catalog for a fashion store, this InDesign template lets you create a modern and stylish fashion lookbook brochure to promote your products and brand in a unique way. This template features 28 beautiful page designs that can be easily customized to your preference. Design a unique product catalog brochure for your business that stands out from the crowd using this InDesign template. It comes with 20 page designs that allow you to promote your products and services to your audience with a touch of creativity. The template is available in US Letter and A4 size. Having a professionally designed portfolio is a must-have for every creative agency and professional. Use this template to design the perfect portfolio brochure to showcase your best work to your clients as well as to present your designs. The template features 16 page designs in A4 size. This creative and stylish flyer template is the perfect choice for promoting your seasonal offers and sales. The template comes with a unique design that will instantly catch anyone’s attention. It’s also fully customizable and allows you to easily change its colors, text, and font to your preference. Designing a simple magazine shouldn’t be an expensive and time-consuming process. With this multipurpose magazine template, you can create all kinds of magazines for businesses and brands with ease. It includes 25 unique page designs with image placeholders for easily placing your images. Use this modern and creative InDesign template to craft the perfect project proposal to pitch your projects to your target audience. It includes 16 unique page designs in A4 size and, in addition to the InDesign file, it comes with a bonus MS Word version of the template as well. Design a more creative and attractive yearbook for your school with this creative template. It features a multipurpose design to let you craft different types of yearbooks and includes 40 page layouts. This elegant and minimalist brochure template comes with a bifold design. The template comes in A4 and US Letter size as well as 3 layout options for inner and cover pages. It’s perfect for making a simple brochure for a creative agency or a small business. Brand manuals help create an identity for your brand and business. This is the brochure you use to explain different aspects of your branding, including branding style, colors, logos, etc. This InDesign template will help you craft a creative branding manual with ease. It includes 20 unique page designs and comes in A4 and US Letter size. You can use this creative brochure template to design an elegant lookbook for a fashion or an apparel brand. It features a landscape design in A4 and US Letter size and the template includes 32 unique page designs. You can fully customize the template using InDesign CS4 and higher. Designing project proposals will be a walk in the park when you have this template on your side. It includes 20 page layouts with paragraph and character styles as well as backgrounds and images in separate layers to let you customize the design however you like. This is a multipurpose brochure template you can use to design all kinds of business brochures from company reports to brand profiles, proposals, and more. The template features 24 customizable page designs with auto numbering options. It’s available in A4 and US letter size. Using minimalist designs is a great way to show off simplicity and professionalism. 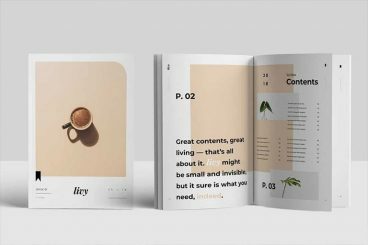 This InDesign magazine template will help you achieve both goals with one design. It includes 42 page layouts with various paragraph and image formatting to create different kinds of magazine and editorial designs. The template is compatible with InDesign CS4 and higher. Another simple and clean flyer template for promoting your special events, sales, and seasonal offers. This template features a minimalist black and white design, which not only makes it look more professional but will help save you printing costs. The template comes in 2 variations and it can be easily customized using InDesign CS4. Whether you’re a designer or an agency, you can use this modern brochure template to make a more effective portfolio booklet to wow your clients by creatively showcasing your best work. The template includes 24 professionally crafted page designs that come in both portrait and landscape layouts. This is a professionally crafted product catalog template you for making an effective brochure to showcase and promote all kinds of products, including furniture, electronics, drinks, clothing, and more. The template features 16 creative page layouts in A4 size. Wouldn’t it be amazing to have a premade catalog full of inspiration prompts to help your team and employees find inspiration and motivation for their projects? You can use this template to design such as brochures like a lookbook or a photo book to create a branded inspiration catalog for your business. The template includes 36 beautiful page designs. For more inspiration check out our modern corporate brochure templates collection.